Given the internal politics of the Conservative party and the supine nature of the main UK opposition party, a hard Brexit remains the most likely outcome of the Article 50 negotiations. 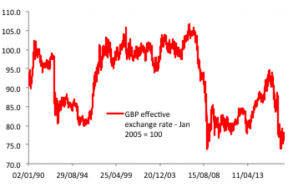 (UK – The emergence of economic clarity.) Maximising economic growth will not be the dominant economic objective of negotiations. A hard Brexit and the uncertainties surrounding the forthcoming period of negotiations risk having a corrosive and cumulative effect on the UK economy. One obvious area of potential weakness is the impact on goods and services from trammelled access to the UK’s largest export market – the EU. There is also the likelihood that bi-lateral trade deals with third countries may be insufficient to offset the impact of costlier access to the EU: mathematically, offsetting reduced exports to a dominant trade partner is difficult; bi-lateral trade negotiations take time, and often exclude services, which are critical to the UK given that the country has a 4.9% of GDP surplus on tradable services; the UK’s negotiating positions might not be strong given the country’s perceived need to sign trade deals and given that the UK will be negotiating as a smaller, stand-alone market. Another obvious risk is to investment, both domestic and FDI, amid concerns over future overseas market access. However, we continue to expect that the initial impact of Brexit will be felt most keenly in the area of consumer demand. As Brexit increases the risks to the UK’s international competiveness, the GBP is expected to continue to act as a shock absorber. Our long-standing forecast of GBP/USD falling to 1.05 reflects the impact of a hard Brexit. However, as the economic dictum states – there is no such thing as a free lunch. The weaker GBP pushes the initial brunt of adjustment to the consumer sector via the mechanism of higher imported inflation. (In January the CPI rose 1/8% Y/Y, up from 0.5% on the eve of the Brexit referendum.) A rise in UK inflation driven by import prices in a climate where nominal wage growth remains weak, is a recipe for a real income squeeze. Indeed, real incomes have been a laggardly component of the post-GFC economic recovery such that even without hard Brexit becoming a central assumption, the Office of Budget Responsibility (OBR) does not expect real incomes to reach the 2008 levels until 2020/21. (Chart 1.) An on-going real disposable income squeeze is set to weaken consumer demand, and there are already signs of this happening. The upsurge in UK growth in H2 2016 (real GDP grew 0.6% Q/Q in Q3 and 0.7% in Q4) was boosted by a front-loading of consumption amid fears of future price prises. Consumer demand has subsequently slowed, with retail sales volume dropping -2.1% M/M in December and -0.4% in January. In December, UK real income growth rose by 0.8% Y/Y, down from 2.1% in November, and with nominal wage growth remaining laggardly real incomes are expected to contract by end-Q1. The problems confronting the household sector are particularly acute given the stretched nature of balance sheets given a rise in leverage since the GFC. Households have increased leverage and savings rates have slumped. Consumer credit rose GBP18.7bn in the 12 months to January 2017, and loans for dwellings rose GBP40.6bn, both back to 2005, credit bubble levels. (Chart 2.) 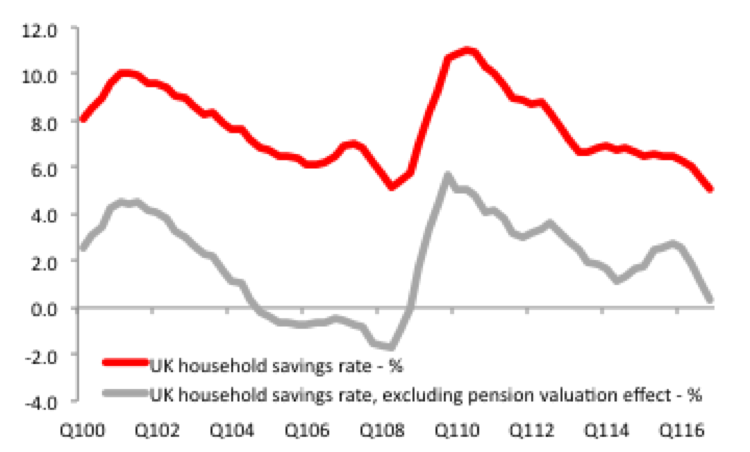 Meanwhile, if pension valuation adjustments are included, at end-2016 the household savings rate measured 5.1% of income or below pre-GFC levels. 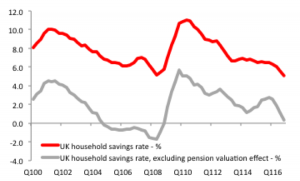 If pension valuation adjustments are excluded, then the household savings rate is just 0.4%, albeit still above the negative levels seen pre-GFC. (Chart 3.) There is little ability for households to offset weak income growth by increasing leverage or drawing down savings. This is a climate where the government needs to delay plans to stabilise the national debt as a proportion of GDP and ease fiscal policy with a view to smoothing the path of the economy through the period of Brexit. Fiscal policy would be a far more effective way to manage downside economic risks over this period than monetary policy given that household balance sheets are unlikely to support a renewed expansion of leverage in the event of additional QE lowering borrowing costs. In contrast to government plans for a possible fiscal easing in 2019, the time for stimulus is also before the formal date of Brexit given the need to maintain economic momentum until this date and – as we noted above – the initial impact of Brexit will fall on the household sector long before Brexit is actualised. We go back to the conclusion that we reached after the Brexit referendum result – the UK economy requires a 2% of GDP stimulus over the 2-year period. The BOE policy easing supported growth by around ~0.4pp, leaving the need for a ~1.6% of GDP fiscal easing. Chart 4. 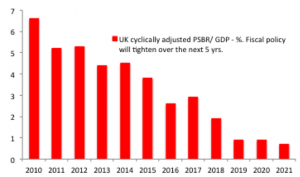 The UK government is committed to a multi-year path of fiscal austerity. Instead of easing, the government is committed to austerity. The government expects its cyclically adjusted public borrowing requirement to decline from 2.9% of GDP in FY 2017/18 to 0.7% in FY 2021/22. (Chart 4.) Meanwhile the cyclically adjusted budget deficit is expected to decline from 0.8% of GDP in FY 2017/18 to a surplus of 1.6% of GDP over the next 5-years. (An increase in the cyclically adjusted public borrowing requirement form 2.6% of GDP this fiscal year to 2.9% next year is not sign of a move to a more stimulatory near-term policy frameworks but reflects one-off factors such as a changes sequencing of payments to the EU.) This is an aggressive pace of austerity, which will prove pro-cyclical into the Brexit-induced economic slowdown. A driving force behind the fiscal consolidation will be reduced public spending. Government spending is targeted to decline form 39.3% if GDP this FY to 37.9% in FY 2021/22, implying a further squeeze on public services. The government currently estimates public debt to peak at 88.8% of GDP in FY 2017/18 and to decline sharply to 79.8% within four years. (Chart 5.) More pertinent than the question of whether this is realistic is the question as to whether it is desirable during the period of Brexit and with Gilts providing little evidence that the level of debt will become a financing problem. Chancellor Hammond spoke of a 1.1% of GDP degree of fiscal headroom, which would allow him to provide stimulus to the economy after the Brexit vote. Alternatively, the funds might alternatively be used as a fiscal sweetener to shore-up FDI or provide tax incentives to strategically important sectors such as finance. (In the event of a hard Brexit, radical concepts such a free trade zone in London or for financial services might have to emerge.) This headroom comes from the anticipated gap between the structural budget deficit in the period following Brexit to the government’s targeted 2% of GDP ceiling on this measure. 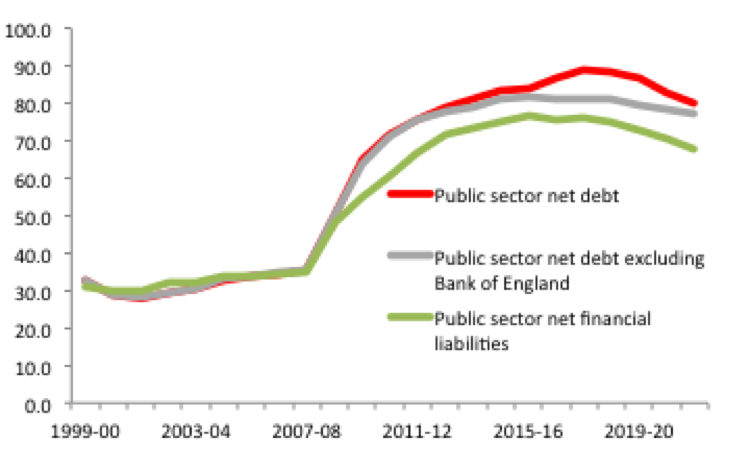 However, with the government committed to reining-in public debt and capping public borrowing, it is difficult to be optimistic that there will be room for a notable fiscal stimulus post Brexit. Firstly, the OBR notes that the perceived 1.1% of GDP fiscal headroom is highly sensitive to the levels of economic growth and the pace at which the government can implement it’s consolidation of public spending. The latter will be politically contentious given that strained public services are already becoming a political problem for the government and given the pledge of the Leave campaign to pour funds into the National Health Service once the UK leaves the EU. On the former, there are downside risks to the OBR’s economic forecasts, which are already above consensus expectations: over the coming 5 years, the ONS assumes average annual UK growth of 1.8%. On a related point, the OBR is not assuming a hard Brexit. Were this to be embedded in it’s forecast, then GDP growth assumptions would be revised lower and public borrowing requirements revised higher. Moreover, the ONS assumptions assume that any current payments to the EU will be reinvested in the UK. This may prove optimistic, as the EU is demanding that the UK pay a “divorce settlement” of ~GBP50bn (2.6% of GDP) to leave the EU due to on-going obligations to spending commitments and pension liabilities. If the UK’s share of EU assets are included, this may lower the payment to a net ~GBP25bn, which would still represent a notable fiscal commitment over the subsequent 10 years. There may also be the need to contribute to EU budgets as a way of facilitating access to the EU market for selective, strategic industries such as finance. Given these factors, it is difficult to see the government having the degree of post-Brexit fiscal flexibility that it is assuming, and given its aversion to expanding the budget deficit, the UK looks set to experience overly tight fiscal policy during the process of Brexit. The lessons for G10 economies of the post-GFC period, when overly tight fiscal policy restrained economic recovery and exaggerated the degree to which monetary policy had to be expansive to provide policy stimulus, have clearly not been learned. Chart 6. 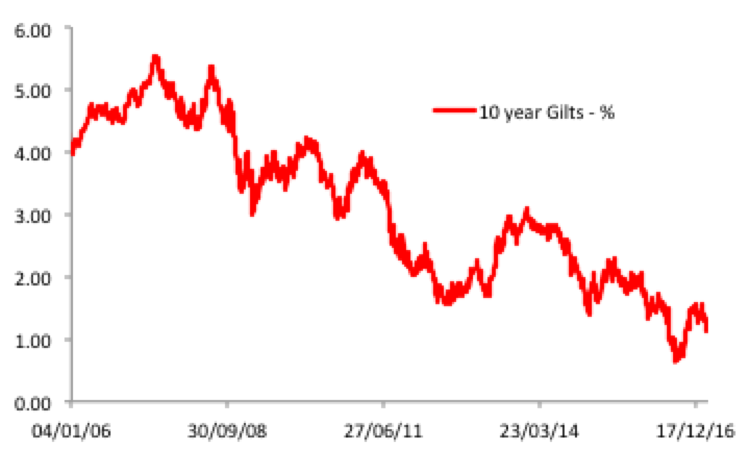 The multi-year rally in Gilt yields has yet to peak. Weak economic growth will provide a cyclical tail-wind to risk-free assets. 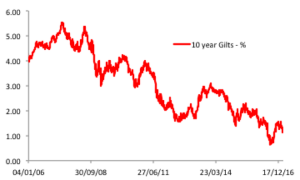 The increased uncertainty over the Brexit period will reinforce the demand for Gilts as collateral instruments. Meanwhile, this backdrop of weak growth, overly tight fiscal policy and loose/ looser monetary policy continues to underpin our forecast of further notable downside risks to the GBP. We see particular value in being short GBP vs. the USD, with 1.05 remaining our medium-term target. This reflects our bias for a stronger-USD internationally and how the US policy mix of looser fiscal policy and tighter monetary policy contrasts that of the UK. (The potential for a USD overshoot.) The downside risks will be magnified by the expected sluggish response of the UK current account deficit to a period of weaker domestic demand and a cheaper currency. 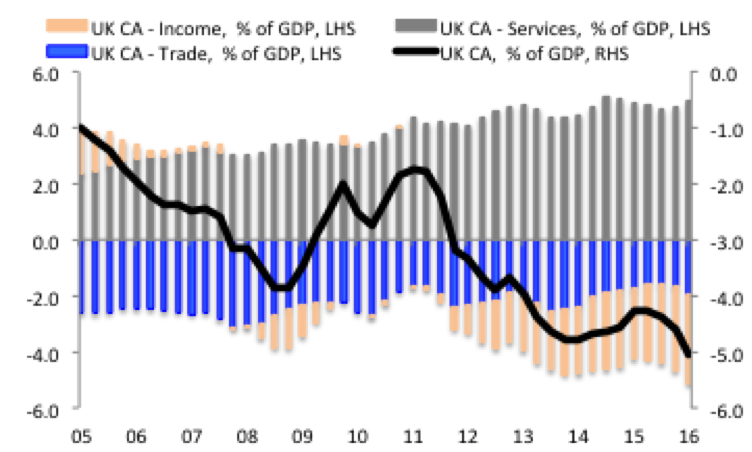 The critical factor behind the widening of the UK current account deficit has been the deterioration of the income account, which is relatively insensitive to FX or GDP growth trends. The UK current account deficit has swung from a recent low of -1% of GDP deficit in Q3 2005 to -5.1% in Q3 2016, and over this period the income balance swung from a surplus of 1.6% of GDP to a deficit of -3.2%, a 4.8pp swing. This deterioration of the income balance exceeded the swing of the broader current account. Chart 8. 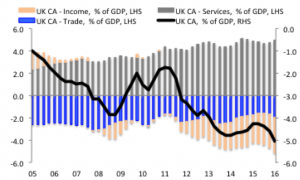 The income account has driven the UK current account deficit wider. 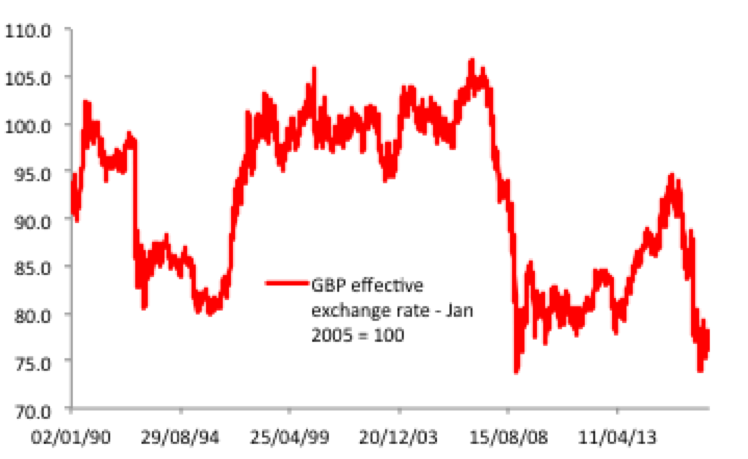 This renders the current account UK relatively insensitive to UK growth and the GBP. Taking a longer-term view, one outcome that presents itself is that a long-lasting implication of Brexit may be a transformed relationship between state and society. 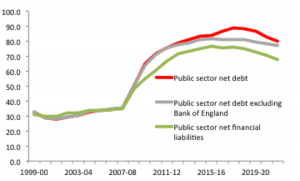 Based on overly optimistic assessments of fiscal flexibility, the government is still assuming an aggressive reduction in public spending despite the strains already being felt across the system. A hard Brexit and any divorce/ continuing payments would exacerbate this squeeze and may ultimately be incompatible with a social security safety net or a health service that resembles the current system. This is a particular risk given that the government has threatened to respond to a poor Brexit deal by making the UK a low tax economy, or “the Singapore of Europe”. A winnowing welfare state could create a multi-year headwind to a household sector that may need to try and increase precautionary savings rates and/or have to allocate more funds to items such as private pensions or contributions to education. 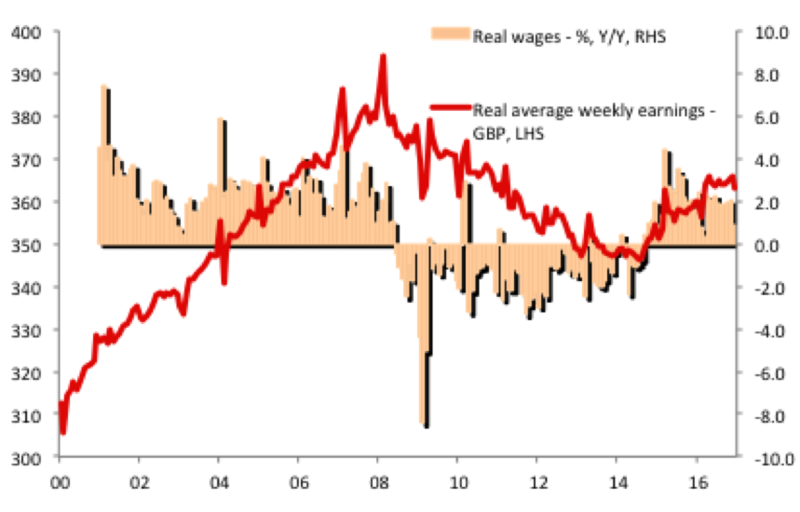 This will come at a time when there is a structural downdraft on UK nominal wage growth due to a reduced pricing power of labour. 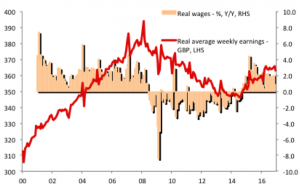 (The income-lite recovery: does the UK labour market portend weak US wage growth.) Of course, this policy mix could lay the foundation for a new era of rapid UK economic growth, but it could equally lay the foundation for another reshaping of the UK body politic as the Brexit movement proves to be the opposite of the populist movement it was originally labelled as. Leaving these broader musings aside and taking a more prosaic perspective, what seems clear is that the clouds are darkening over the medium-term outlook for the UK consumer. This entry was posted in Event Risks and Left Tail Events, Fiscal Policy Activism, Income Lite Recovery, Monetary Policy Expansiveness, Opportunities and Right Tail Events by Des Supple. Bookmark the permalink.